Legendary Britain is a more illusive place than it once was. But there are still places where it is sometimes hard to tell where fact ends and fiction begins. 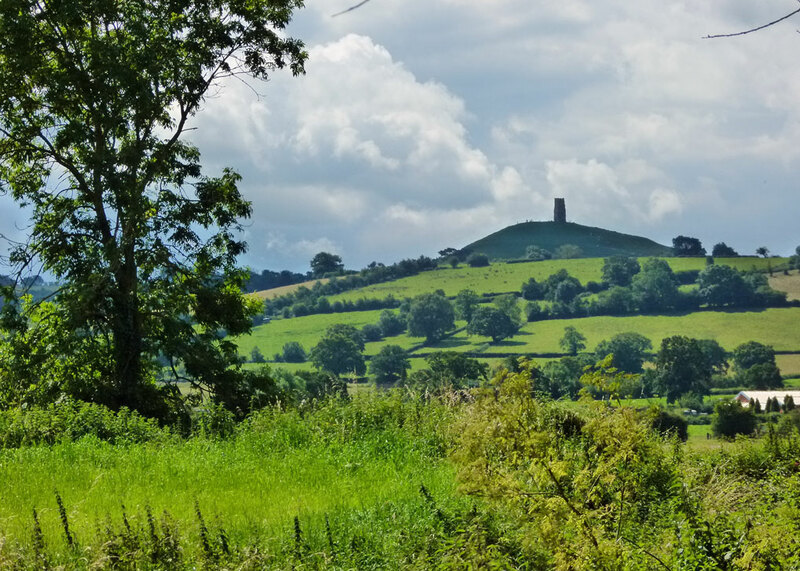 Mysterious Glastonbury Tor, a natural feature rising some 500 feet above the watery Somerset Levels, has been a sacred site since before the Romans came. It is the home of Gwyn ap Nudd, King of the Fairies and Lord of the Otherworld. It is Ynys Avallach or Ynys yr Afalon, the Isle of Avalon. It was Merlin’s stronghold and where the sword Excalibur was forged. Some say it contains an ancient maze. Some believe the Tor is Ynys Wydryn, or Ineswitrin, the Isle of Glass – though this name is more usually associated with Glastonbury itself. At the Tor’s base, under the Chalice Well, Joseph of Arimithea, the Jew who arranged for the burial of Jesus, is said to have buried the Holy Grail. On nearby Wearyall Hill, Joseph’s staff is said to have blossomed into the Glastonbury Thorn. The song Jerusalem is said to have been based on a legend that Jesus visited Glastonbury as a child. And so on. 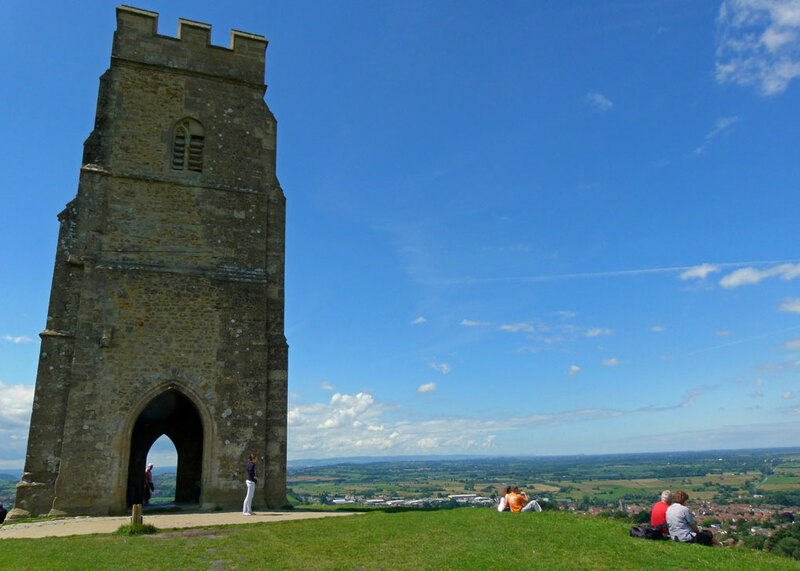 One thing we do know for sure is that Glastonbury Tor was where the last Abbot of Glastonbury was cruelly executed. Even for an old sceptic like me, seeing Glastonbury Tor for the first time can be a magical moment; an instant where you take a sharp breath and think, “Oh, there it is.” The Tor (tor is an ancient word meaning ‘rocky peak’) can be seen from miles away, standing proud in the landscape it has dominated since time out of mind. Closer by, if you’re travelling by road, it seems to disappear as you approach the town. There is no option but to leave your transport somewhere in Glastonbury itself and proceed on foot. Find Chilkwell Street, the A361 to Pilton (see map below). From there, you can either head roughly east along Dod Lane and follow the footpath, or take the path off Wellhouse Lane, close to the Chalice Well. The latter route is a concrete path, easier in wet weather, and less steep; or you can do a circular walk, up one way and back the other. The views alone from the top are worth a bit of lung-heaving. In the distant past, before the waters receded and the surrounding land reclaimed, the Tor would have been an island in the sea. Even today, the Somerset Levels is a landscape of rivers and wetlands, prone to flooding. Prehistoric tools and Roman artefacts tell us that the Tor has certainly been in use for many centuries, though not necessarily occupied. Nearby Iron Age lake villages were constructed on artificial islands in c250BC, though I don’t believe there is any evidence for humans living on the Tor itself until perhaps the 5th centuryAD. Two graves, orientated north-south – so probably not Christian – have been found, together with 6th century fragments and the remains of a forge. We can only speculate why the local population apparently decided not to take fuller advantage of this high ground. Perhaps it really has always been a sacred hill. The Tor has terraces on its sides, which are thought to be man-made: theories for the purpose of these have included some kind of agricultural use, a maze, or even the remains of a spiral walkway; but no one knows. Buildings were constructed on the summit in the late Saxon period, and these probably had some sort of Christian use. Perhaps they supplanted an earlier shrine – it was common Christian practice to take over older pagan places of worship. This might explain the decision to build a wooden church or chapel there in the 11th or 12th centuries. The chapel was destroyed by an earthquake in 1272 and replaced in the 14th century by a stone church, St Michael’s. The iconic tower that stands on the Tor’s pinnacle today is all that remains of this; the rest, apparently, was smashed and removed during or after the dissolution of the monasteries in the 16th century. So what of the legends? Geoffrey of Monmouth in his 12th century History of the Kings of Britain (Historia Regum Britanniae) says that the legendary King Arthur’s sword, Caliburn (Excalibur), was forged on the Isle of Avalon. Arthur, mortally wounded after his last battle of Camlann, was also carried off to the Isle of Avalon to be healed of his wounds. The Isle of Avalon was a mythical place, one of several Celtic islands of the Otherworld. The name could be derived from the ancient British word aval (apple), so Ynys Avallach could be ‘isle of apple trees’. Or it could refer to the ruler of the island, Avallach, who lived there with his daughters, including the enchantress Morgan le Fay. 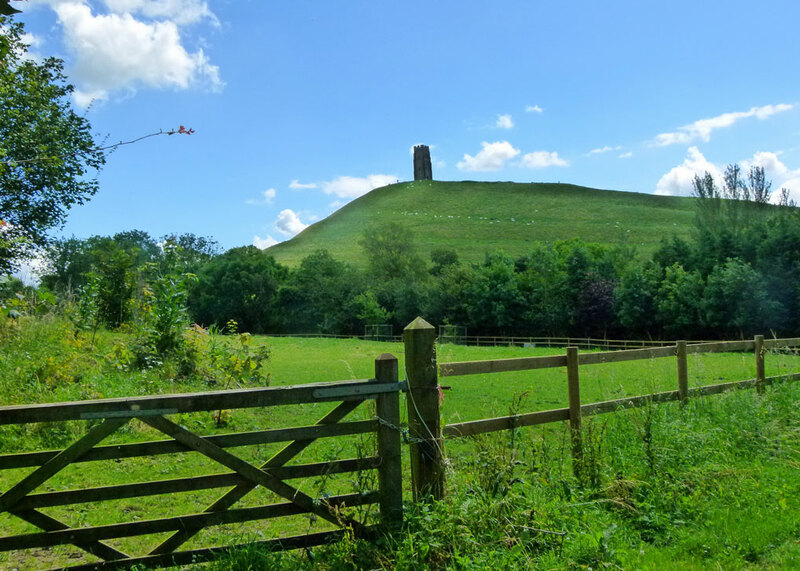 Somehow, Glastonbury Tor became associated with the Isle of Avalon – possibly due to the association of Glastonbury with Arthur and the supposed discovery of Arthur’s grave in the Abbey in 1191. Less than 20 miles to the south west is Cadbury Castle, one of the many reputed sites of Arthur’s Camelot. Glastonbury Tor is also linked with Annwfn, the Celtic Otherworld, and its lord, Gwyn ap Nudd, sometimes also known as the Fairy King. Fairies were not necessarily the twee, benign, figures of Victorian imagery. It was common to believe that some hills were hollow and it is said that Gwyn had his palace inside the Tor. 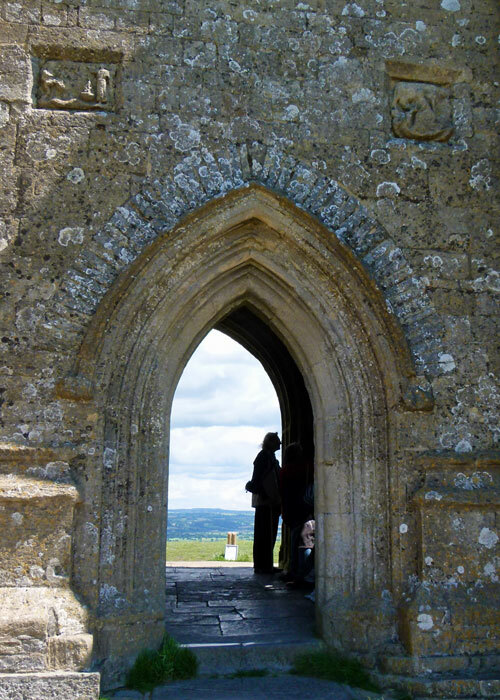 A 6th century wandering saint, Collen, was living as a hermit on the Tor when he was invited to visit Gwyn. Collen eventually agreed to go and, entering the hill by a secret door found himself inside a fabulous palace, confronted by the terrible Gwyn seated on a golden throne. The king offered food, but Collen knew it was dangerous to accept fairy food. Having taken the precaution of bringing some holy water with him, he sprinkled this all around, the king and his palace vanished, and Collen found himself back on the hillside, shivering. It’s hard to take all this in if you visit Glastonbury Tor on a busy, sunny, day with people all around trying to enjoy it as much as you are, and getting in the way of your photographs. But it’s food for thought, the views are great – and you’ve got to go, haven’t you? While you’re there, spare a thought or a prayer for Richard Whyting, the last Abbot of Glastonbury, who we mentioned at the start. Arrested on charges of treason and stealing monastery property in September 1539, after a mockery of a trial in Wells, Wyting was sentenced to death along with his fellow monks, Treasurer, John Thorne, and Sacrist (the official in charge of sacred vessels), Roger James. 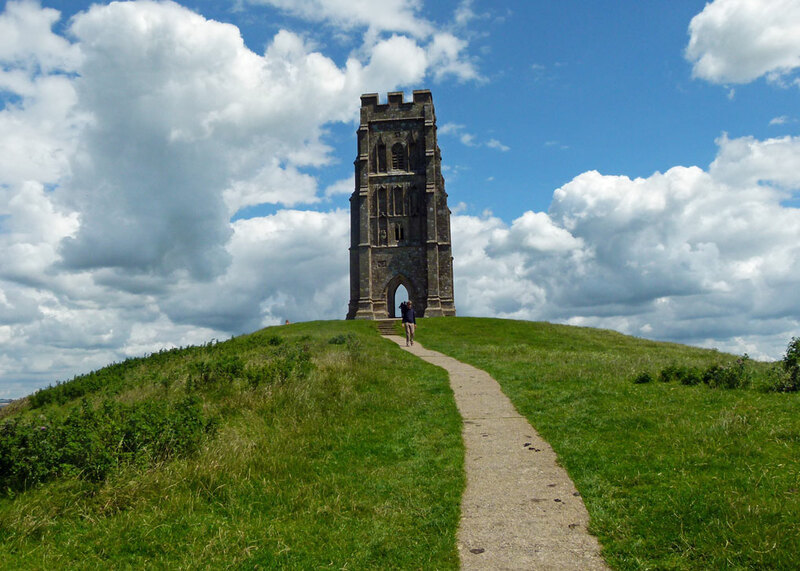 The three men were taken to Glastonbury, strapped onto hurdles, and dragged by horses to the top of the Tor. Here, looking across the plain to the distant hills and down on the now abandoned Abbey that had been their home, they were hanged, drawn and quartered. The Abbot was in his late 70s. His head was displayed over the Abbey gatehouse and the four parts of his body at Bridgewater, Ilchester, Bath and Wells. Somewhere I’ve always wanted to visit! Well, you’d obviously enjoy it – though not quite as hilly as you’re used to! Great views even if nothing else is true, but when there are so many legends, you have think that there is some truth in them. But of course all good Scots know that the Arthurian legend is more directly associated with Arthur’s Seat in Edinburgh! We lived in Bradford-on-Tone for 18 months about 12 years ago (near Wellington and Taunton) and managed to visit Glastonbury on a freezing day in January. We didn’t have the time before it got dark to go up the Tor and I always regret this. Thanks so much for your informative and beautifully illustrated post. I love Glastonbury. It has such an atmosphere of mystery. And the town itself is wonderful. Another fine bit of British history!. You always put excellent detail into your blog. I very much appreciate your efforts. My kind of countryside even without the famous tower but I’d like to visit it when it was quiet to really enjoy it. Merlin and Arthur certainly got about the UK, Cornwall, Wales, even a relatively new theory about Hadrian’s Wall, Northumbria and Southern Scotland being a potential location as they can’t seem to find a real person in history, king or otherwise, from that time period in that general area that would fit the myth and create the legend. Such a gorgeous spot and full of history, my kind of place to see! The punishment given was so brutal, it is very hard to comprehend. I mean, we read “hanged, drawn and quartered” but my God, to think of knowing what is to come for you…just so terrible to think of. A lot of history linked to that tower… that I can’t believe I didn’ t get to see when I was in Sherborne! Taking over pagan sites is part of reclaiming creation. Anyway, we were at Wells but didn’t go to Glastonbury. I’m not sure why, but it probably had to do with getting someplace else before dark and being unfamiliar with B roads to get there. A very interesting post, and it makes me wonder about the drawing and quartering practice, along with putting heads on pikes or whatnot. It must have been the worst they could think of. Cadbury Castle sounds delicious. I’ve been past it many times but never had time to stop for a visit. Must rectify that. Couldn’t have been easy living in the Middle Ages. Would pay to keep your head down. Or lose it. Never been … but I think I’d love it! We went there and up to the top many years ago. I don’t think that we would make it these days! Brutal. But a lovely spot. I see I’m in for a treat after having a little look-see around your blog. Gorgeous pictures of my beloved England. A fascinating history, and such a beautiful place!